The story of Les Misérables has long been considered a highly regarded piece of art. Whether indulging in the original 1862 novel by Victor Hugo, or relishing in the many successful film and musical adaptations worldwide since its release, people have always been drawn to the narrative of Les Misérables. Masterpiece from PBS has taken Hugo’s classic novel and reimagined it into a six-part dramatic television special that viewers won’t soon forget. 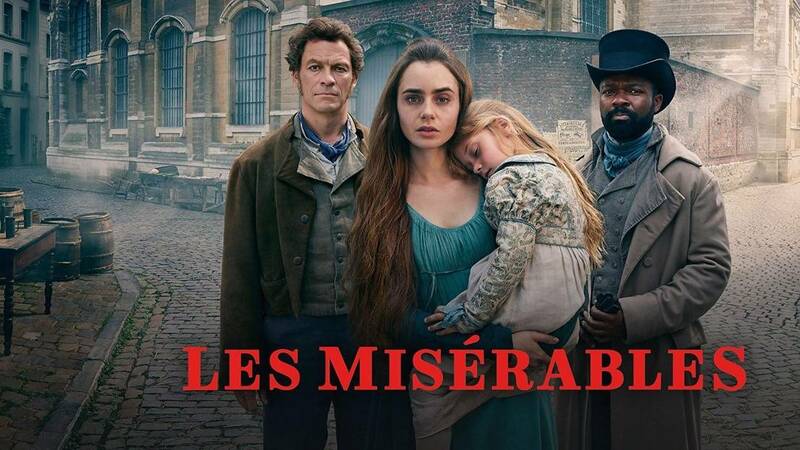 Rhode Island PBS proudly premieres Les Misérables on Friday, April 26 at 9 p.m. An encore showing airs on Monday, April 29 at 1 p.m. Each new installment of the series premieres every Friday at 9 p.m., with the accompanying encore presentations airing Mondays at 1 p.m.
Les Misérables takes place in early 19th century France and follows the life of Jean Valjean, a man who was previously imprisoned but flees his parole. He starts a new life as a factory owner, eventually adopting an orphan named Cosette. However, trouble brews when an inspector named Javert will stop at nothing to capture Valjean. The political upheaval of this moment in French history is evident throughout Les Misérables. However, the story is more than simply a historical account of the turbulent time period. It’s also a passionate tale of love, redemption, and survival that will be sure to stand out in the viewer’s mind. The television adaptation of Les Misérables was conceived by award-winning screenwriter Andrew Davies. In this six-part series, Davies brings to life the world-renowned novel that started it all. Vivid imagery and vibrant plotlines help to engage audiences like never before and put a fresh spin on the well-known story. The distinguished British cast includes Dominic West (The Affair, The Hour) as Jean Valjean, and David Oyelowo (Selma) as Javert. They are joined in this epic television event by Lily Collins (Rules Don’t Apply, Love, Rosie), in the role of Fantine. The series premiere begins with protagonist Jean Valjean’s release from prison for stealing bread. After serving a long and unbearable prison sentence, he resorts to petty crime to survive. Later, Valjean meets Bishop Myriel, who teaches him a valuable lesson about life. The first episode of Les Misérables premieres on Friday, April 26 at 9 p.m. Encore showing airs on Monday, April 29 at 1 p.m. The second episode of Les Misérables sees a complete turn of events in the life of Jean Valjean, who has now established himself as a respectable factory owner. Valjean soon hires single mother, Fantine. However, problems arise when Valjean reunites with his old rival Javert. The second episode of Les Misérables premieres on Friday, May 3 at 9 p.m. Encore showing airs on Monday, May 6 at 1 p.m. The third installment of Les Misérables focuses on Valjean saving the life of an innocent man. However, his good deed comes at a large personal cost. Meanwhile, Valjean tracks down Fantine’s daughter, Cosette. Javert is in close pursuit of Valjean, and to escape he’ll need a miracle. The third episode of Les Misérables premieres on Friday, May 10 at 9 p.m. Encore showing airs on Monday, May 13 at 1 p.m. The fourth part in this epic series event highlights the life of Cosette, now a bright young woman, as she makes her way to Paris under Valjean’s staunch protection. There, she meets handsome law student Marius, who at first seems like the perfect man. However, he unwittingly brings a nightmare to life. The fourth episode of Les Misérables premieres on Friday, May 17 at 9 p.m. Encore showing airs on Monday, May 20 at 1 p.m. The fifth episode of Les Misérables follows the revolution as it hits Paris. Valjean and Cosette go into hiding, while Marius desperately searches for Cosette. Javert obsessively seeks out Valjean with no intentions of resting until the ex-convict is successfully captured. The fifth episode of Les Misérables premieres on Friday, May 24 at 9 p.m. Encore showing airs on Monday, May 27 at 1 p.m. The epic drama of Les Misérables comes to a head in the series finale. The sixth episode sees Marius at the barricades, where a hostile Valjean intercepts him. They flee together through the sewers of Paris. The storylines of Cosette and Javert reach a thrilling conclusion. The final episode of Les Misérables premieres on Friday, May 31 at 9 p.m. Encore showing airs on Monday, June 3 at 1 p.m. The compelling story of Les Misérables is a testament to the struggles of the French underclass of centuries ago. However, themes from this narrative are still relevant to viewers today. With poignant honesty and brave storytelling, screenwriter Andrew Davies brings the tale of Les Misérables to new levels on the small screen.